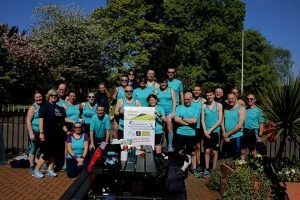 Well done to everyone who took part in today’s John Enright Memorial parkrun mob-match between Bournville Harriers and Kings Heath RC at Cannon Hill. Team turnouts were neck and neck, with BvH fielding 103 runners to the Lions’ 104. The trophy has a new home back at Rowheath as we won with 56796 points, versus Kings Heath’s 47256! Well done Team Teal and commiserations to Kings Heath (although I’m sure they’ll agree it was a fantastic morning and it is always the taking part that really counts). Kings Heath won the battle of the cakes, raising £645.30 of the combined total; an amazing £1230 all of which goes to the British Heart Foundation. Well done to KHRC and everyone who baked and ate! Thanks very much to all the volunteers and supporters from both clubs and to the Cannon Hill parkrun core team as always. This entry was posted in Announcements, Parkrun, Race Reports by BvH Admin. Bookmark the permalink.